H2H is the Fashion Brand in Korea, design our own slim fit style for men and women in highest qualities and workmanship to provide consumers special experience. Most of our styles are Korean sizes and smaller than US or EU size. 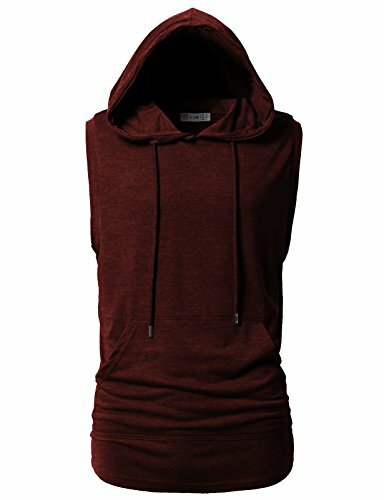 Sleeveless Hoodie Tank-Top with Pocket and side Plackets, which give you comfortableness. It is completely suitable for people who's finding clothes to wear for work out or casual look as well. US Small (Asia M)-------Shoulder 17"----Chest 40"-----Length 27.5"
US Medium (Asia L)-----Shoulder 17.5"----Chest 42"-----Length 28.5"
US Large(Asia XL)-----Shoulder 18.25"----Chest 45"-----Length 29.5"
US X-Large (Asia 2XL)-----Shoulder 19"----Chest 48"------Length 30.5"
US 2X-Large (Asia 3XL)-----Shoulder 20"----Chest 52"------Length 32"
US 3X-Large (Asia 4XL)-----Shoulder 21"----Chest 56"-----Length 32"